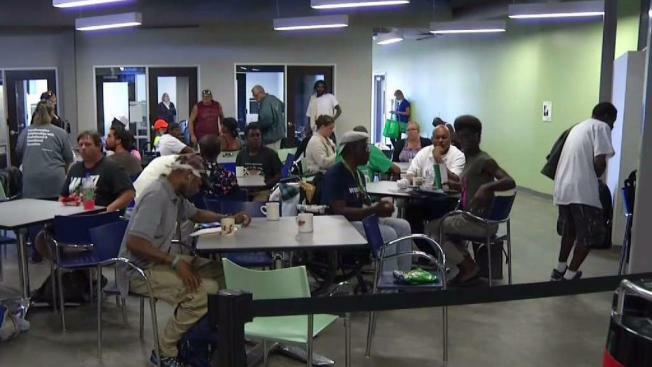 A new, non-profit homeless shelter just south of downtown Dallas, OurCalling, is offering shower facilities, laundry service and spiritual resources to anyone who walks through the door, with nobody turned away. The secured facility at 1702 S. Cesar Chavez Boulevard is a brand new facility that is not only opening its doors to anyone, but also offers resources that previously were not offered to Dallas' homeless population. The shelter is an idea and mission that some of those that live and work in Dallas welcome. Lance Peterson has owned Shop and Go Grocery on Cesar Chavez Boulevard for decades and said he has certainly seen a variety of customers.Peterson even knows the local homeless by name. "This lady across the street from here has been here for a month. You see all the stuff she has," Peterson said. But now, just steps away from the corner there's a place for the homeless woman to go. "They're seeing a welcome person over there it can only help their situation," Peterson said. OurCalling celebrated the official opening Thursday and provides laundry services, private bathing areas, full meals and even mental health and spiritual counseling services. "We developed this facility specifically for the unsheltered homeless to have a place to meet some of their support service needs but in the process of that try to address what's going on inside while they've been in this condition for awhile and how do we address those needs in a responsible way," said Pastor Wayne Walker, the executive director of OurCalling: Discipleship Ministry for the Homeless. Pastor Walker's facility is a first in Dallas that doesn't require ID's, everyone is welcome, even those with criminal backgrounds. It is something downtown resident Andrew Powell hopes will help alleviate the homeless crisis in Dallas. "To me that should be a big solution to help fix the problem, I mean there's no excuse as to why people can't go to that point," said Powell. "Being able to go to a place that's not questioning them so much, just giving them a helping hand sounds great for the neighborhood," said Peterson. For more information visit OurCalling.org.